Gold Cup Food Processing Plant — Choson Exchange - Visit North Korea & Support Local Entrepreneurs! It was a chilly November morning in Pyongyang, and after three consecutive days of workshops with over a hundred North Korean entrepreneurs, we were ready for some sightseeing. Our partners extended an invitation to visit the Gold Cup food processing plant on the outskirts of the city and we were happy to accept. Gold Cup is situated in Pyongyang’s Mangyongdae district. This name will be familiar to many as the birthplace of Kim Il Sung, Kim Jong Un’s grandfather and the country’s first (and only) President. However, whilst a pilgrimage to the hallowed ground of Kim’s humble beginnings is a rite of passage for many visitors to the capital, the nearby industrial area is somewhat off the beaten track. Rows of workers tended complex machinery producing a wide variety of confectionery. Watching a kind of white paste churning relentlessly along a conveyor belt and into a processor where it was neatly spun and chopped into intertwined marshmallows was in equal parts satisfying and hypnotic. A hair-netted lady working on the production line talked us through her duties; a sample tray of sugar-dusted rice cakes (ddeok) was proffered to us, found to be delicious, and duly devoured. Venturing further in, we encountered a room with a white-overalled attendant at a desk with a computer and phone, and one entire wall lit up with flashing indicators, presumably indicating current production figures, capacity, and highlighting areas of inefficiency in the production process. It felt like we had reached the nerve centre of the facility. I had absolutely no idea what he was doing, but it looked pretty cool. Like many showcase North Korean facilities, Gold Cup is not so much a 9-to-5 place of employment as a campus for workers and their families. Moving through the factory we saw accommodation, sports and medical facilities, but the pièce de résistance awaited us on the top floor. 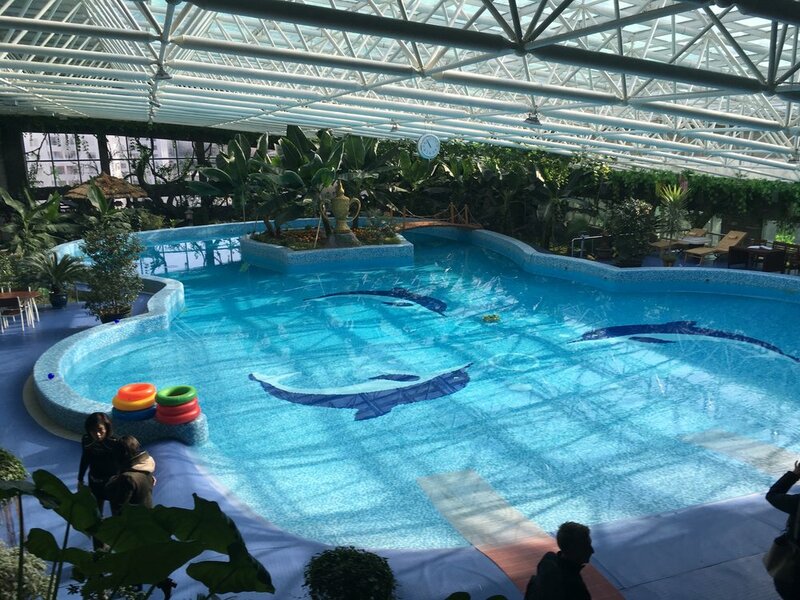 Pushing through two layers of plastic hanging curtains, the humidity increased and we found ourselves under an all-glass roof with a pool, deckchair recliners, palm trees and a bar. Staff padded around in shorts, and we found our winter coats uncomfortably warm. Our guide informed us that this was somewhere for the workers to relax and unwind on non-working days. 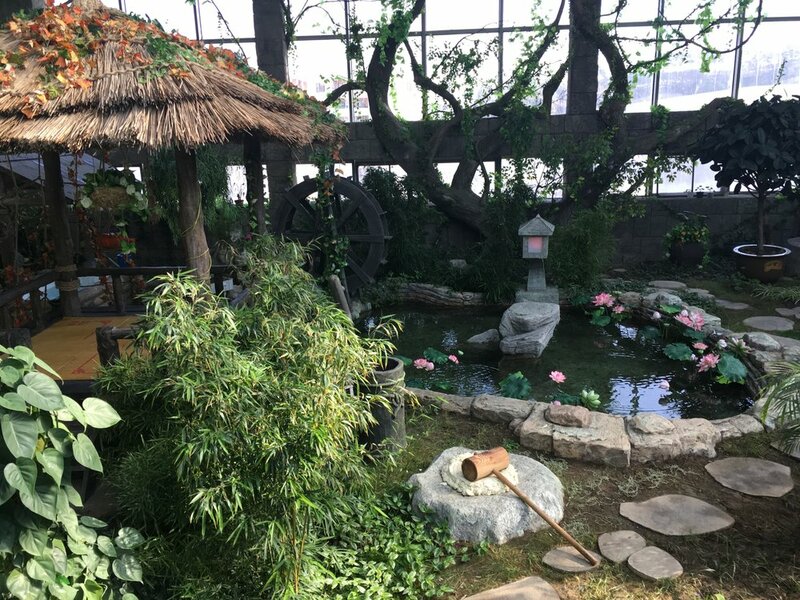 Famous as the North Koreas are for being rhetorically committed to a Worker's Paradise, at Gold Cup they've had a decent go at recreating a tropical paradise for their employees. If only every workplace were like this.